King Sihanouk unsuccessfully attempted to keep the communist North Vietnamese soldiers from entering the country, as well as the United States and its allies, but only managed to upset the US, who saw Sihanouk as a North Vietnamese sympathizer. In January of 1970, Sihanouk went abroad due to medical reasons, and in his absence General Lon Nol carried out a coup d'etat against the king. Under the power of Lon Nol, Cambodia was immediately allied with the US, the monarchy abolished, and the country renamed the Khmer Republic. Cambodia became the forefront of worldwide news in 1975 as Communist Khmer Rouge forces captured the capital city of Phnom Penh, and ordered the evacuation of all cities and towns. Millions of Cambodians were subsequently executed, and many more died from horrible living conditions. In 1978, a Vietnamese invasion followed by two decades of fighting drove the Khmer Rouge out, and then in 1993, UN-sponsored elections helped restore some level of normalcy. A coalition government, formed after national elections in 1998, brought renewed political stability and the surrender of remaining Khmer Rouge forces in 1998. Still rebuilding from decades of war, Cambodia continues to see an advancement in its economy, and maintains one of the best economic records in Asia in terms of growth. The capital city of Phnom Penh, located where the Bassac, Sab and Mekong rivers merge, is the main entry point into the country for travelers, and most tourists journey to this far-off land specifically to visit the ancient temples of Angkor Wat. What is the Capital of Cambodia? What Language Is Spoken In Cambodia? What Type Of Government Does Cambodia Have? 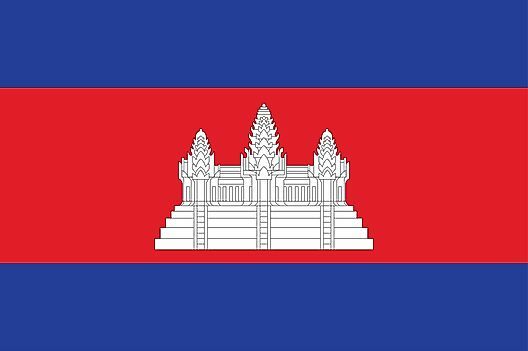 What Do the Colors and Symbols of the Flag of Cambodia Mean?